If Donald Trump bucks the odds and wins tomorrow’s election, he’s planning to offer cabinet positions to a handful of fiercely loyal surrogates who refused to jump ship during his often messy campaign. 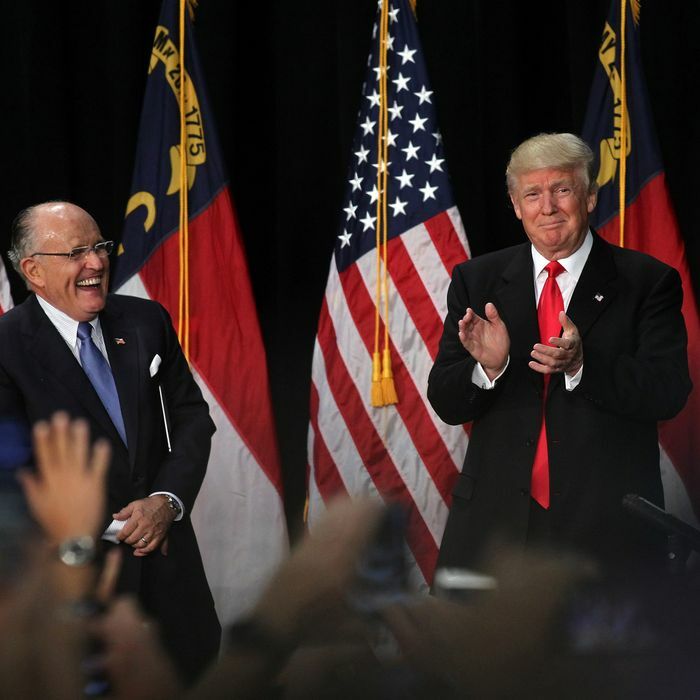 Among them are former New York City mayor Rudy Giuliani and onetime Speaker of the House Newt Gingrich, NBC News reports. Among the names being considered, according to conversations with three campaign advisers who requested anonymity to speak freely: Rudy Giuliani for attorney general, Newt Gingrich for secretary of state, retired Lt. Gen Michael Flynn for defense secretary or national security adviser, Trump finance chairman Steve Mnuchin for Treasury secretary, and Republican National Committee finance chair Lew Eisenberg for commerce secretary. NBC News says Trump has not worked much on the transition efforts, but not because of a lack of interest. He’s just superstitious and afraid that too much planning for a win would jinx him. Speaking of planning, the man who has officially been tasked with putting together a cabinet for Trump, Chris Christie, has reportedly “drifted from the campaign.” The New Jersey governor is the chairman of Trump’s transition team, but Alabama senator Jeff Sessions has taken over those duties as Christie has become less involved. Another bold-faced name being considered for a top job in the Trump administration is Republican National Committee head Reince Priebus, who is reportedly under consideration to serve as Trump’s chief of staff. That would leave a vacancy at the RNC, which could potentially be filled by another Trump loyalist.